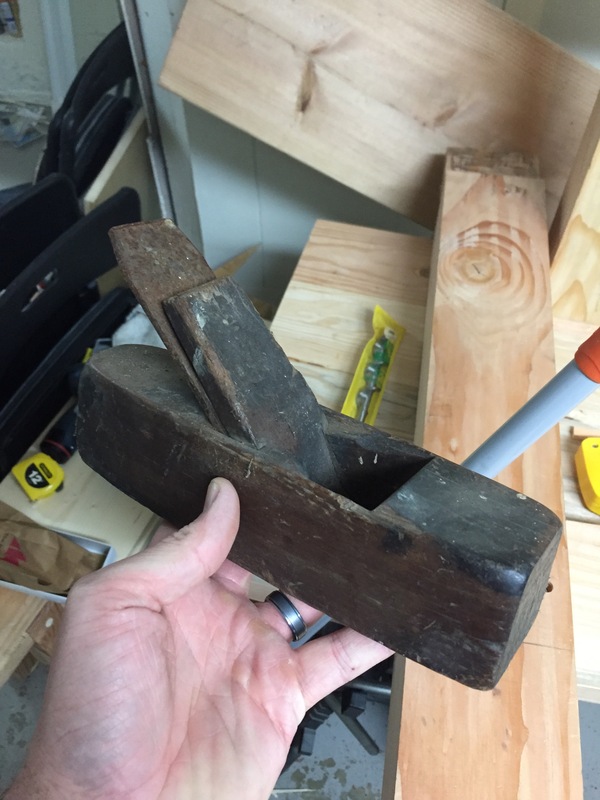 Having already drilled all of my dog and holdfast holes, last night I started working on the self for my bench and I realized two things: end vises are awsome and scrub planes eat 2x4s for breakfast. 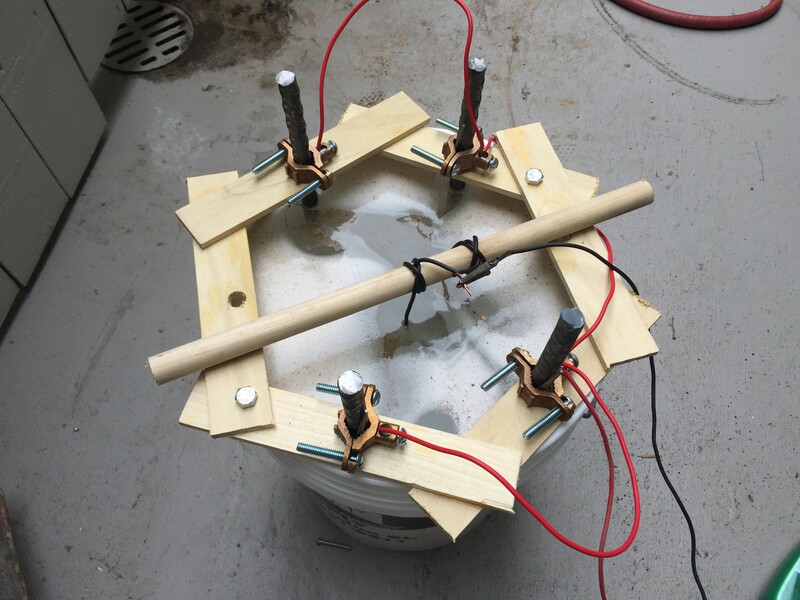 Chris’s design uses a 1×1 cleat on the stretchers to support the shelf boards so decided to rip them out of a old, junk 2×4 that was originally part of a crate. 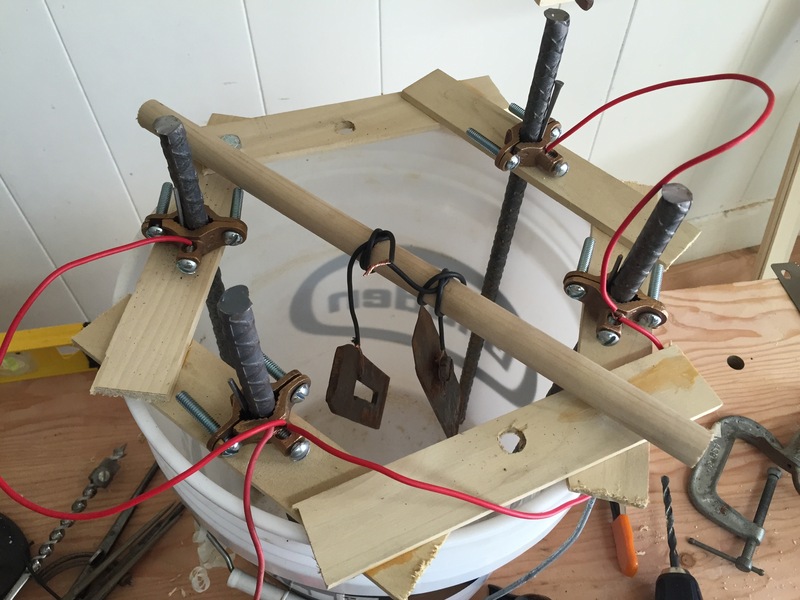 I used my new bench top band saw to rip off two strips and the squared one of the strips but forgot to square the other before I put the saw away. This meant I had nearly a half inch of wood to remove. 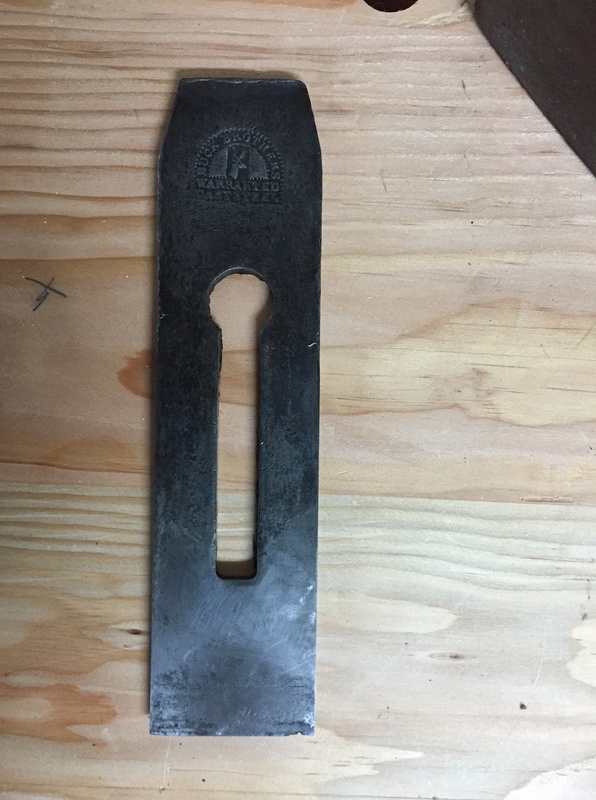 The scrub plane destroyed this in about 5 seconds, flattening the back of the blade made a big difference. Then I squared and smothed the faces with my #7 and I will install them to tonight. 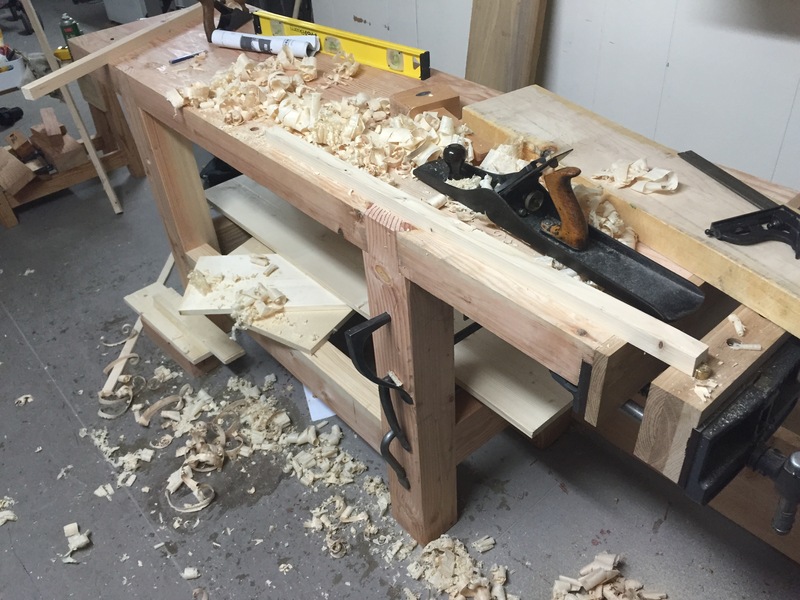 Last night I flattened the benchtop, drilled some holes in the front leg, and adjusted the end vise’s chop to fit/line up better. 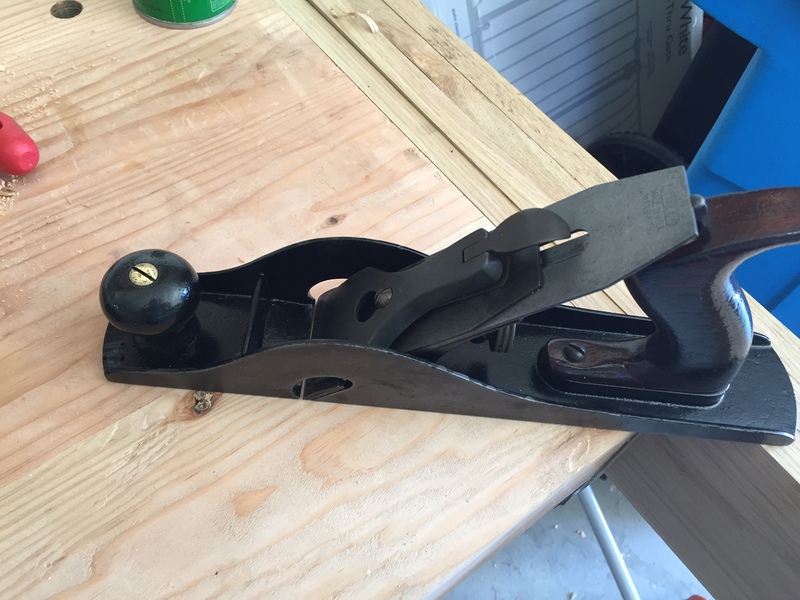 The Stanley #10 was very useful working on the chop since I put a sloped rabbet On the back side to line up with the vise face. I’ve ordered some more of the leather I used on the Moxon vise which will finish it off. The two dog holes in the back right corner work for the moment but this weekend I plan on adding a few along the front edge and a few more holdfast holes. 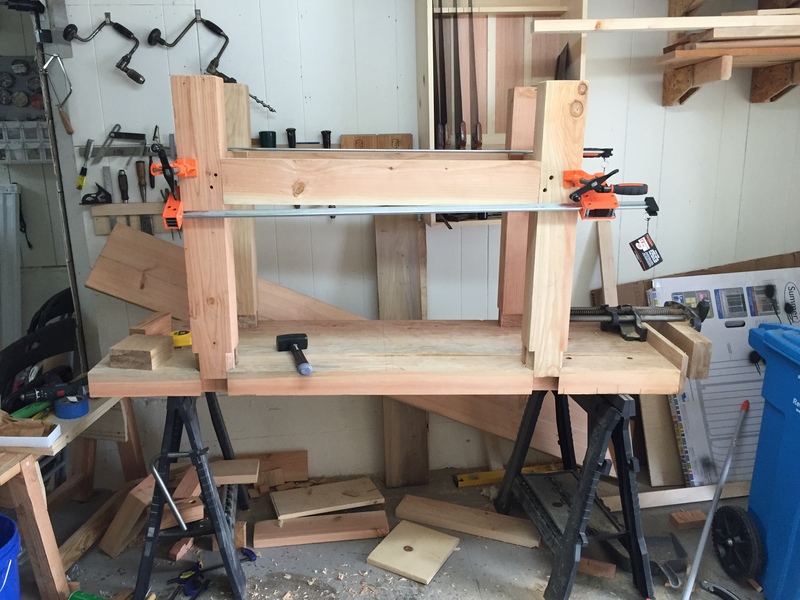 I still need to add the bottom shelf and build the deadman and leg vise but it’s already functional. 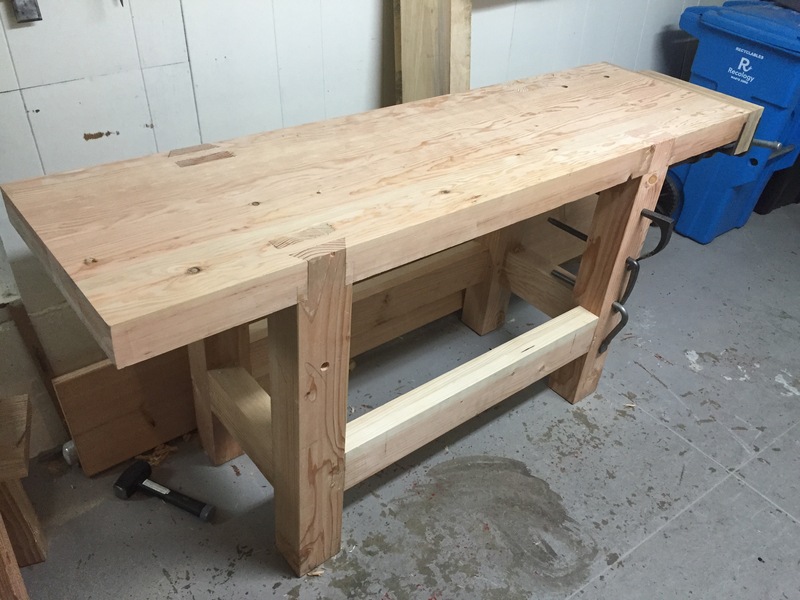 After spending all day Saturday at the Bay Area Galoot’s Bag-a-thon (it is fun to spend time with other people who suffer from the same affliction) I spent Sunday putting together my bench. 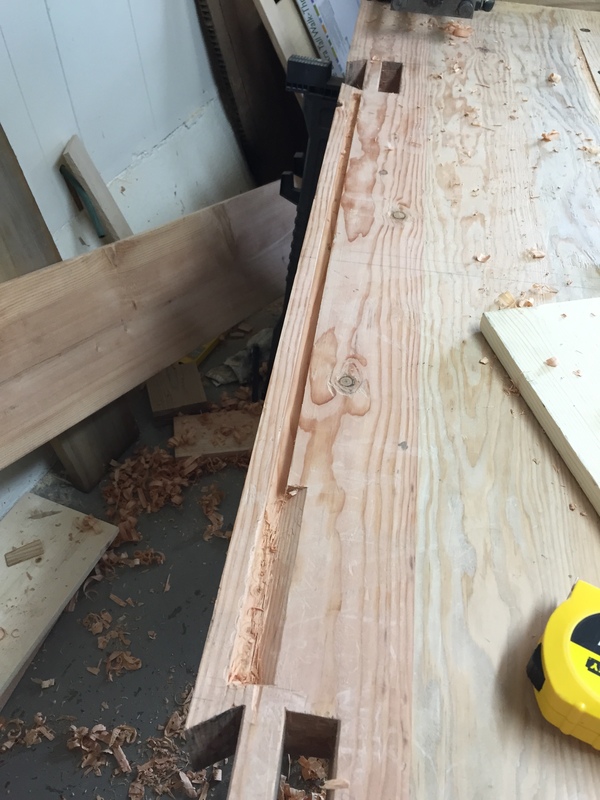 Once all of the stretcher tenons were cut it was time for a dry fit to mark out the draw-bore pin locations. 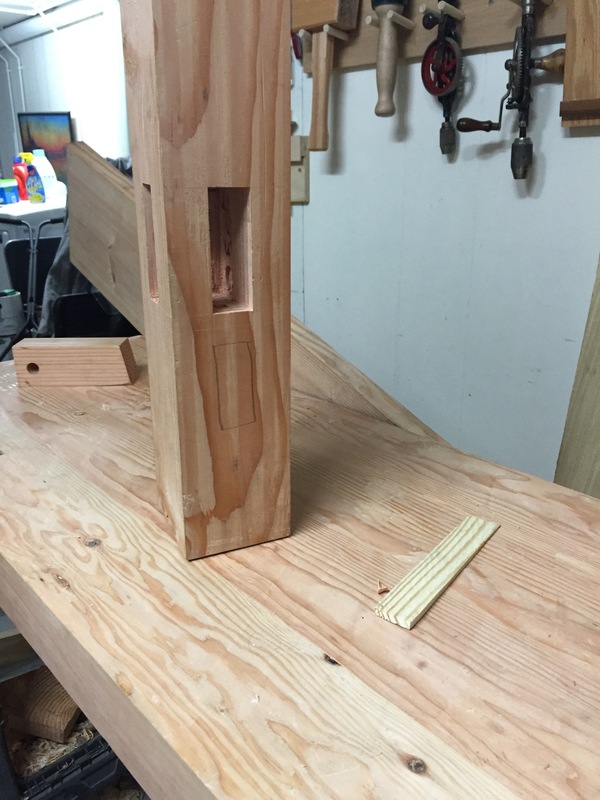 I then drilled the corresponding holes in the tenons, offsetting them 1/16th of an inch. 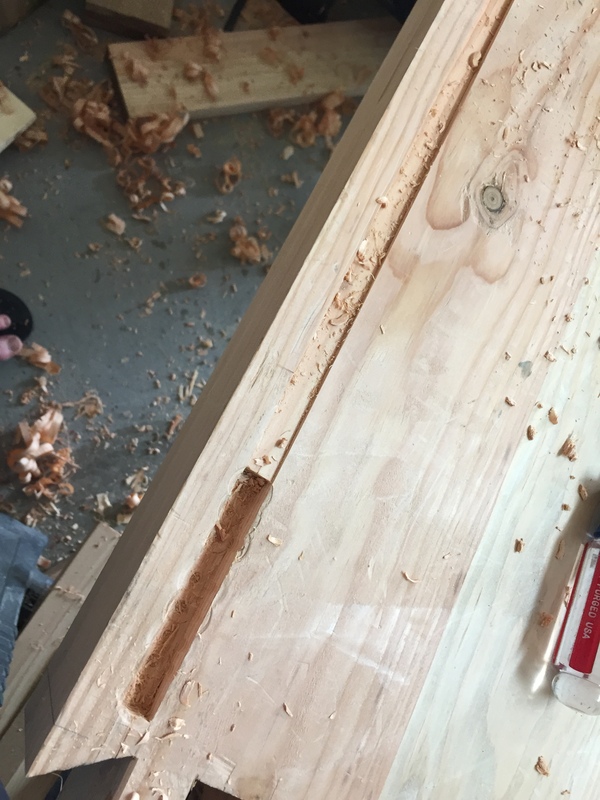 I then realized I had not cut the groove for my future sliding deadman so I marked out a half inch wide groove 3/4th of an inch from the front edge and marked the center line of the groove. 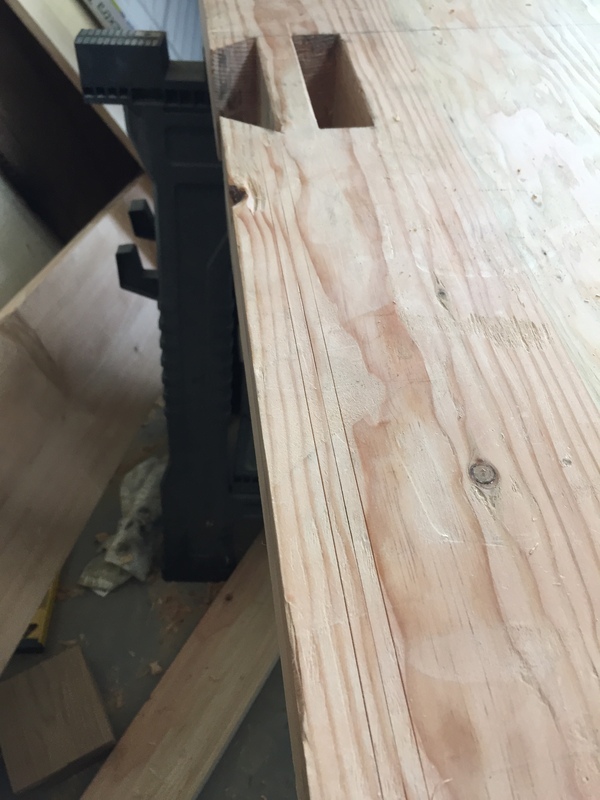 Then I bored out a 5 inch wide, 1.2 inch deep mortise on each end with my brace. 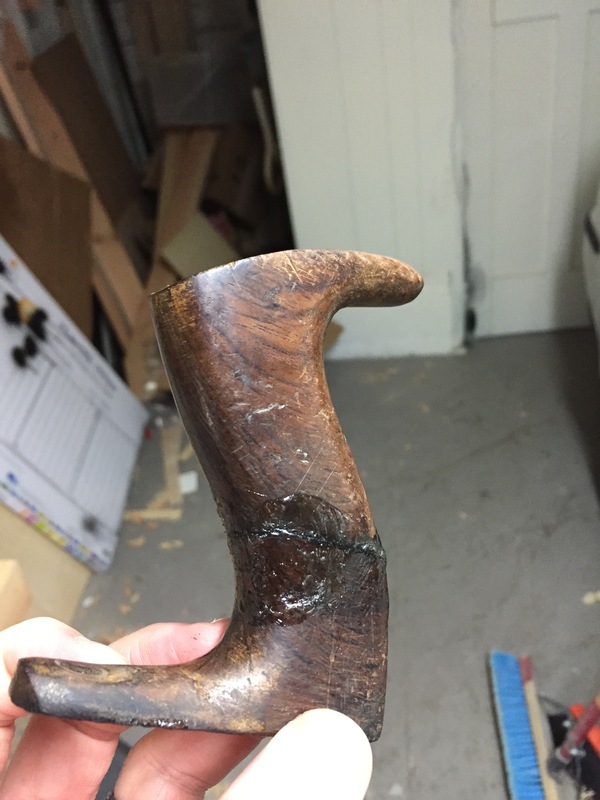 Next out came the Stanley 45 with a half inch cutter which made short work of the groove (I ended up swapping the fence side half way and using it left handed to make things easier). 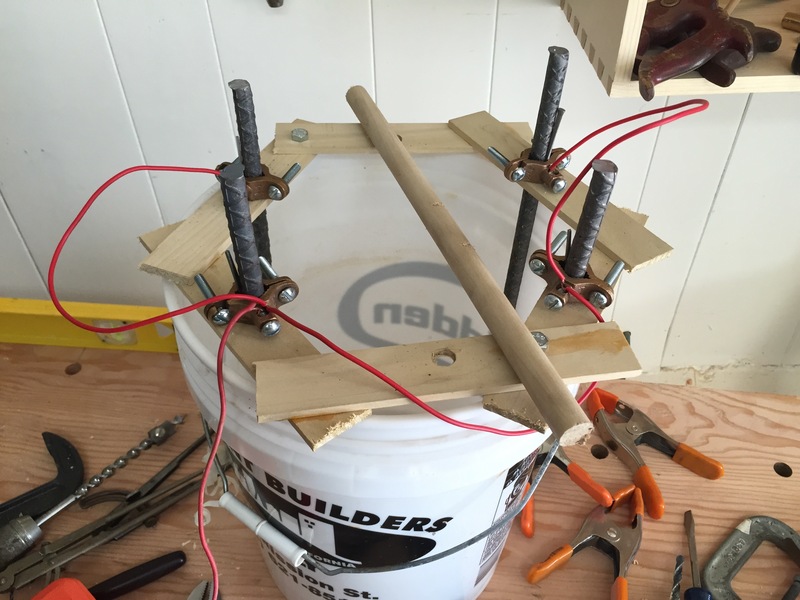 Once the groove was cleaned up I added a ramped area of the groove to make added/removing the deadman possible. One the kiddo was put to bed it was time to actually assemble everything. Titebon liquid hide glue was put in all of the cortices and the undercarriage was assembled and slid into the through mortises. 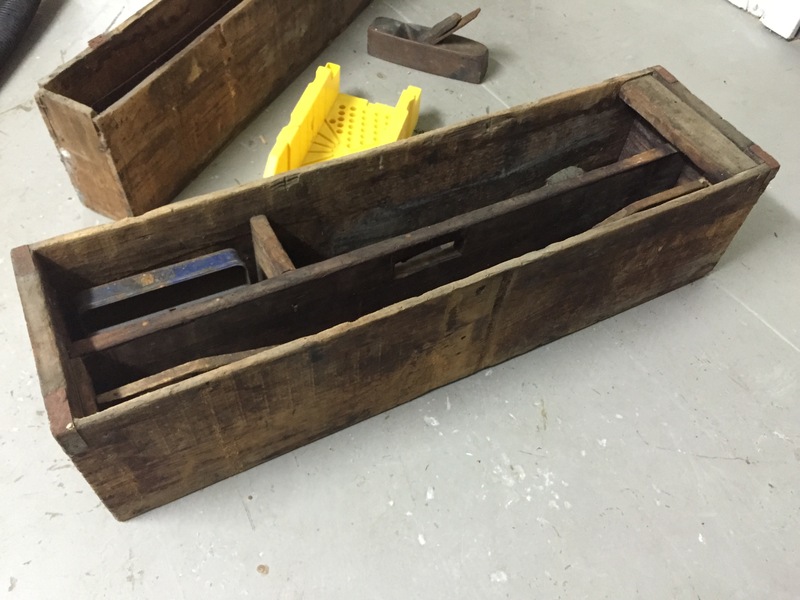 Then through a combination of clamping pressure and a small sledge the legs was worked into final position and clamps were applied to all of the stretchers before the oak pegs (tapered and waxed of course) were driven home. I only had one peg failure so it went pretty well. 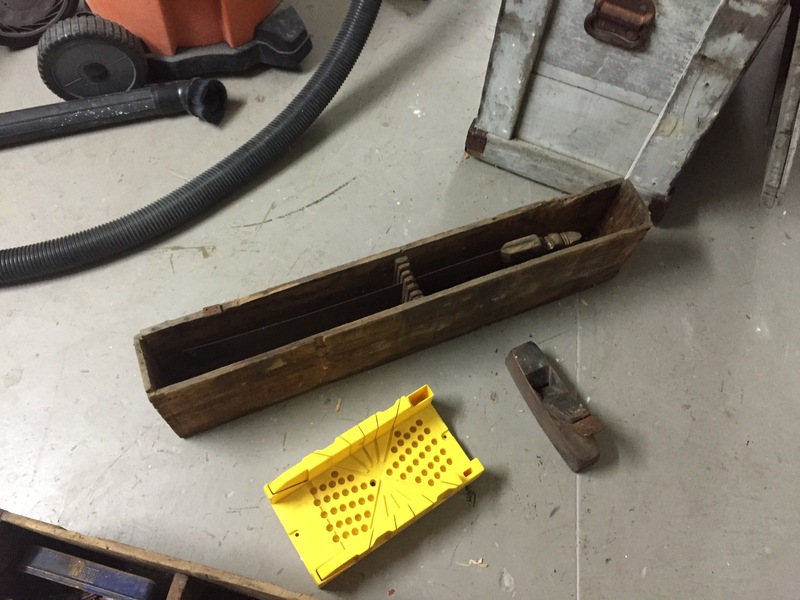 While walking home from the bus stop last night I noticed an old English style tool box next to a pile of refuse, in front of the “creepy” house in the neighborhood. 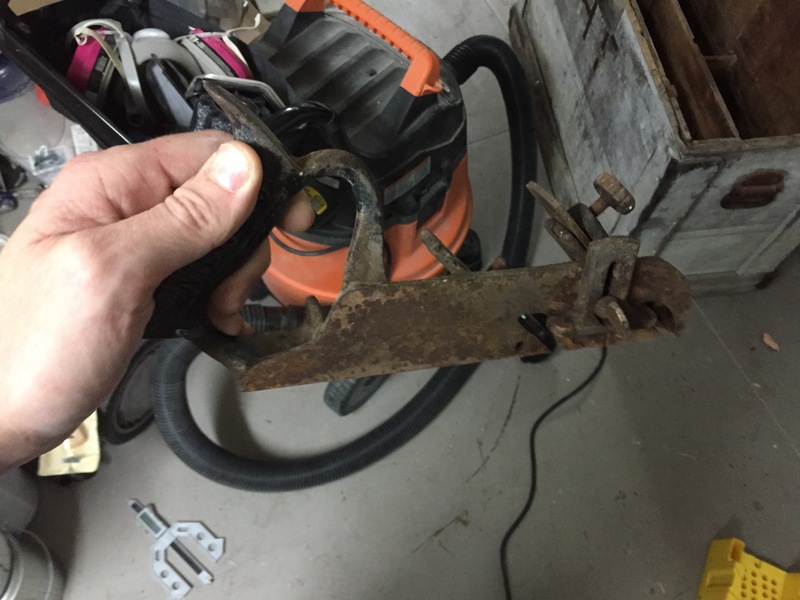 The lid hinges were mostly rusted through and I noticed a saw in the saw till so I picked it up and brought it home (I left a note in case it was not trash). This was easier said than done since part of the bottom fell out when I picked it up. 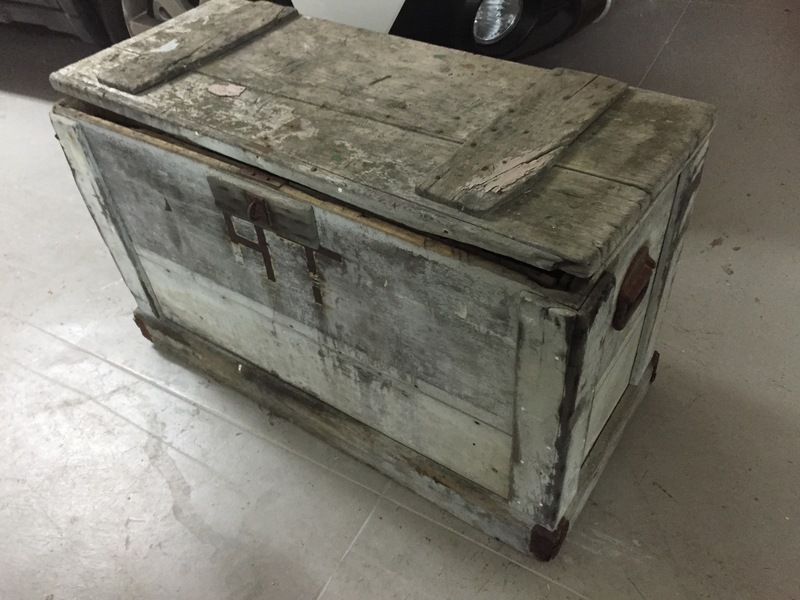 This box had either been exposed to the elements for some time or was stored somewhere wet as the wood has serious water stains and rot. Opening it up found a removable saw till (which used to have a lid) at the top and a removable too caddy with a handle. At the bottom were subdivided compartments. 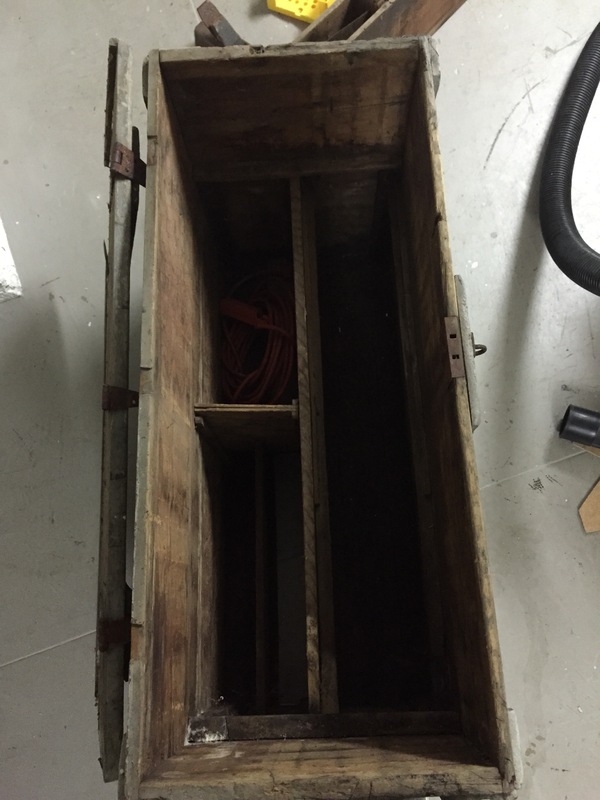 Overall the contents was junk, literally; but there was a badly rusted Union 45 rabbet plane and a neat little coffin smoother. 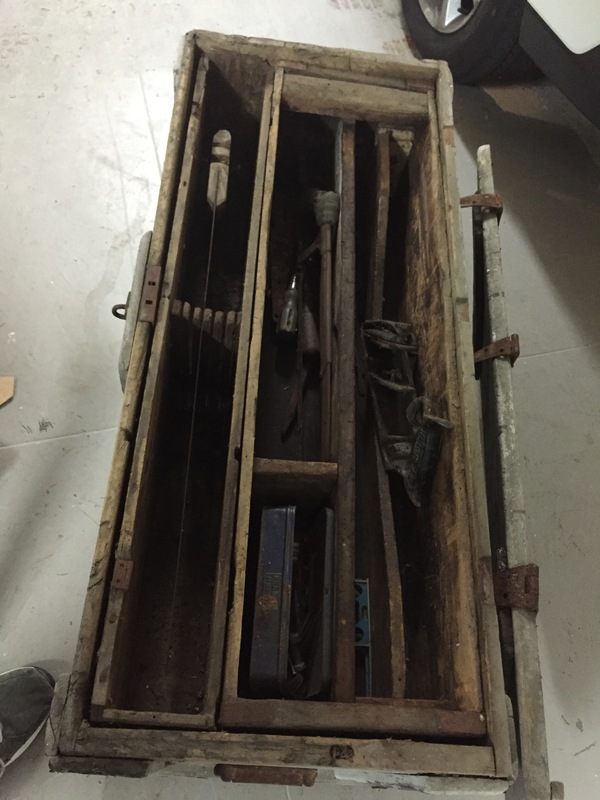 The saw saw straight but the blade is very rusted and the handle looks water damaged. One of the first phrases my son learned and understood was “Uh Oh”; when you hear a toddler go “Uh Oh” you have no idea what you are going to find. Well last night I had an “Uh Oh” moment (what I said was a bit less family friendly). 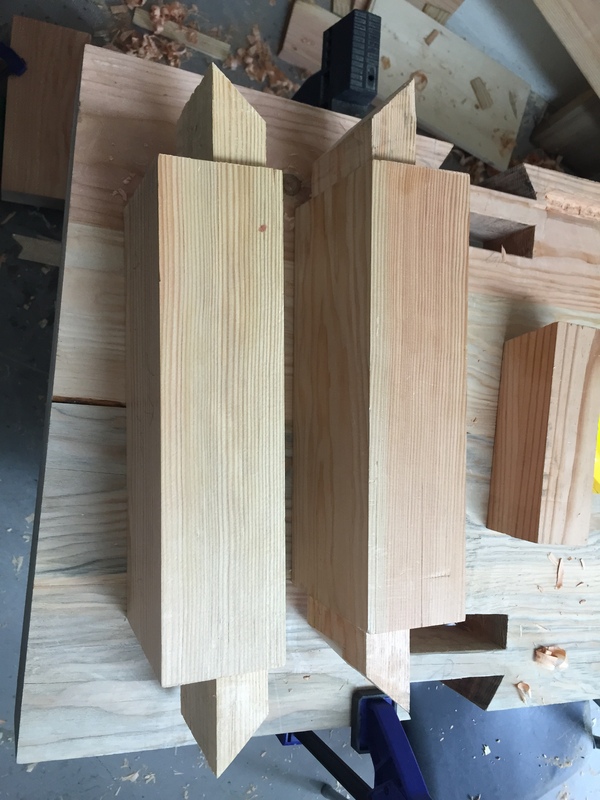 As I mentioned in yesterday’s post, I finished chopping the stretcher mortices in one of the legs. 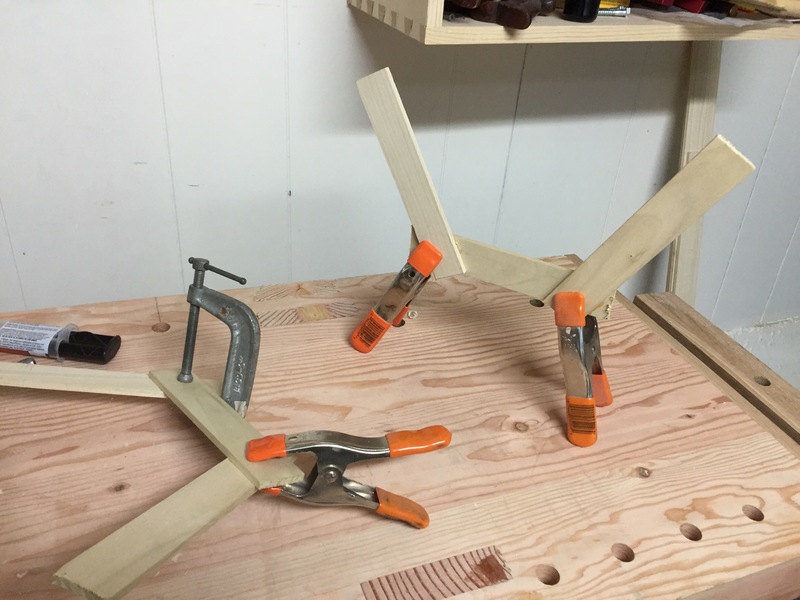 I then drilled out one side of the mortice on the other three legs and since it was late, I decided to hold of on the noisy act of chopping and laid out some of the 3/4″ holes in the right front leg (which is the one I finished morticing). In his original design, Chris had three holes with an 8″ spacing. 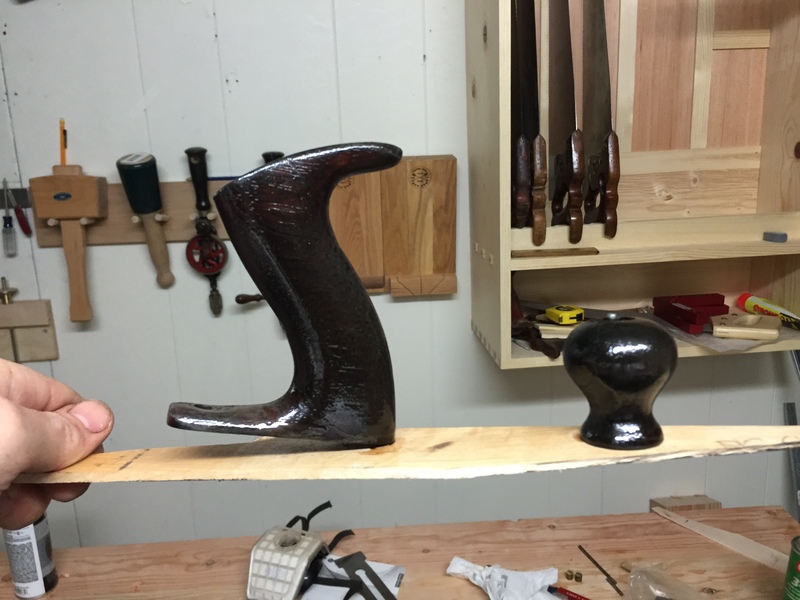 When I marked these out, the bottom hole ended up in the middle of the mortice. 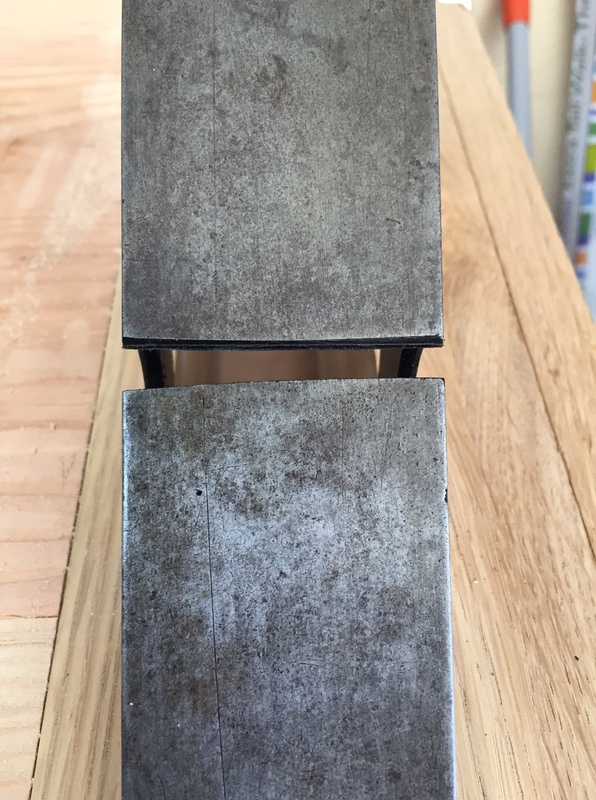 Apparently, when I laid out the mortices I was on the wrong side of the line I marked during the dry fit….. 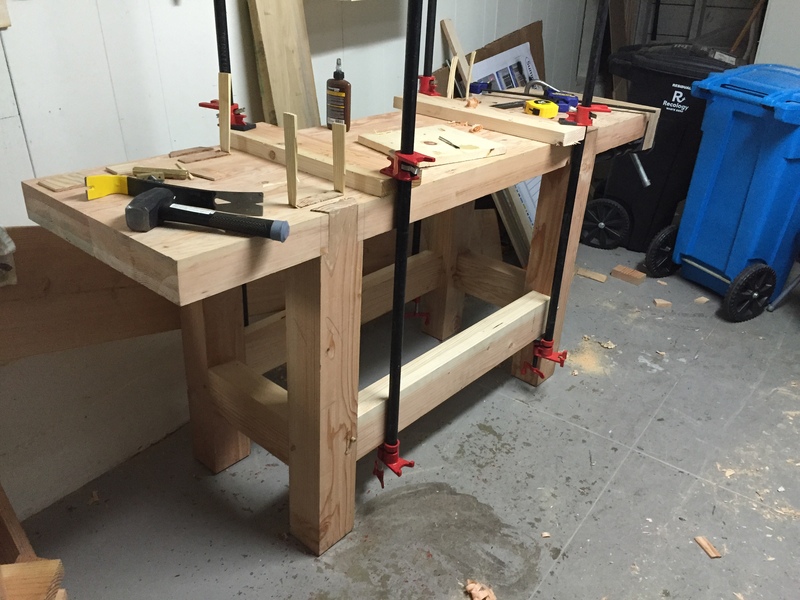 The platforms on my saw horses at 8 inches from the floor so I think my Moxon vise will still fit under the bench. 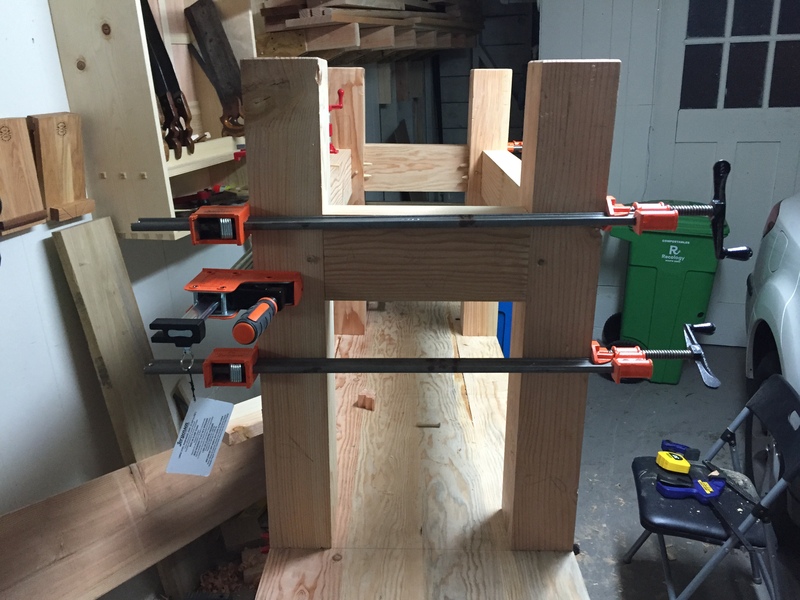 Unfortunately I marked and cut the front and rear stretchers based on the “correct” placement and the new position will end up interfering with the lower support of the leg vise so I will end up stooping more to adjust the pin.